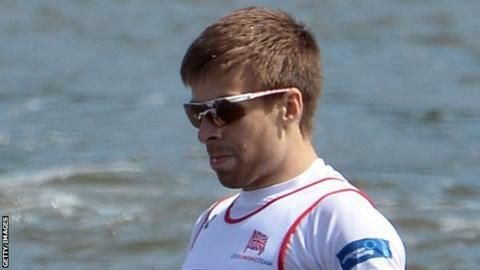 Coleraine rower Joel Cassells retained his European men's lightweight pair title as he and San Scrimgeour took gold for Britain in Brandenburg. Cassells won the title with fellow Coleraine man Peter Chambers last year. Chambers, meanwhile, helped the British four take silver behind defending world and European champions Switzerland. Enniskillen's Holly Nixon and her GB team-mates were fifth in the quadruple sculls final with Alan Campbell third in the B single scull final. London 2012 Olympic bronze medallist Campbell said afterwards that he had been suffering badly from hay fever over the weekend in Germany. Cassells and Scrimgeour dominated the lightweight pair final and had over three seconds to spare from Denmark at the finish. The lightweight pair is a non-Olympic boat class but Cassells and Scrimgeour will have reminded the Great Britain coaches of their selection claims for the lightweight four. Chambers, Mark Aldred, Jonno Clegg and Chris Bartley led the fours final at the halfway stage before the Swiss took control to win by a length. Enniskillen's Holly Nixon and her Great Britain crew mates Rosamund Bradbury, Jess Leyden and Kristina Stiller were going along well in fourth place before catching a crab just before the halfway mark which stalled the boat momentarily. They eventually finished fifth behind winners Germany and will now finalise their preparations for the Olympic qualifying regatta in Lucerne in a fortnight's time. There was success for Ireland in the men's lightweight double sculls when brothers Gary and Paul O'Donovan from County Cork rowed through leaders Norway in the closing 500m to clinch gold. Reigning world champions France and silver medallists Great Britain - Coleraine's Richard Chambers and Will Fletcher - were missing from the field but that doesn't detract from a memorable moment for Irish rowing. There was a second medal for Ireland in the women's single sculls when London Olympian Sanita Puspure took bronze behind scullers from Austria and Latvia.